Investment in the renewal and growth of library capital projects allowed the City to address a backlog of rehabilitation and renewal for library facilities and to build new libraries in growth areas of the City. New branch libraries in Clareview and The Meadows are under construction, and work has begun on Mill Woods Senior Centre and Multicultural Facility. Mill Woods Library Branch Replacement to open in 2014. 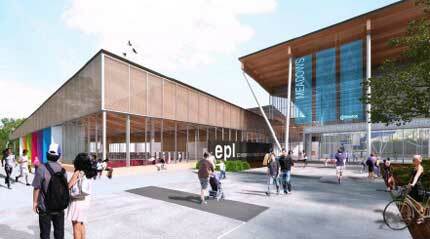 Meadows Library Branch to open in 2014. Clareview Library Branch relocation and expansion to open in 2013. Jasper Place Library Branch replacement to reopen in 2012. Highlands Library Branch replacement to reopen in 2013. Investment for new library materials, equipment, furniture and IT infrastructure. Renewal of Highlands Branch and land and design for Calder Branch.